When I was 17 I had a boyfriend that lived in a nearby village. There were no buses in the evening so we had to walk everywhere. My boyfriend and I decided that we needed a bike. 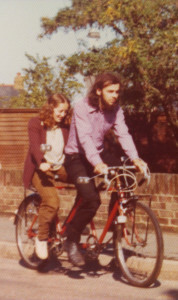 He knew I was fed up with riding a boy’s bike so hit upon a brilliant plan – to build a bicycle made for two. He managed to find a tandem frame by looking in the small adds. It was a mixed frame and had a ladies frame at the back and a man’s crossbar on the front. With a tandem frame we then had to build the rest of the bike. We asked friends to help with searching for bits and pieces and stripped old bikes of various parts. We had to buy the wheels as these were not standard. It took about 2 months and in the end the tandem was finished. Painted and with panniers on the back we were ready to ride. We had a summer job working in at The Metal Box factory some 12 miles away from where we lived. We were put on shift work but had to ask to be on the same shift because we had to share the bike. We became a regular sight cycling through the country lanes at all hours. When we approached the factory we were always greeted by other workers with the chorus of “Daisy Daisy”. When we got engaged the canteen sang the song as they gave us a card and presents for our bottom draw. The celebrations were short lived and when we broke up the following year there was much discussion about the fate of the tandem. In the end he kept it, as he had done most of the work. He rode it, alone, and it seemed just to make the split even more public. I don’t know what became of the tandem in the end.